NVMe: What it is, what it will be, and do you need it? First, SSDs lowered latency and improved IOPS. Then NVMe protocols helped PCs speed up individual applications. The logical next step is the jump to network fabrics. What’s next for this rapidly evolving technology? 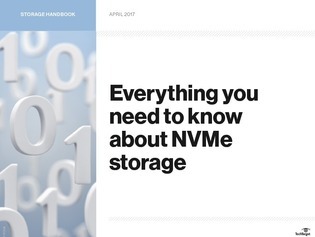 Read this handbook to get an answer about that question, as well as a look back at NVMe's pedigree so you'll better understand what technologies it was built to replace. Then learn about what is going to happen with NVme next, so you can decide for yourself it it's something worth researching more.